Are you ready to meet the challenges and opportunities presented by a new digital landscape? What new solutions must you adopt in order to continue making progress? Learn more with Gravity Union’s CEO and lead consultant Michael Schweitzer on how your organization can be ready for compliance challenges in the Cloud! Join us for the two day 2019 ARMA Houston event! Come and learn what’s new and exciting in all things records management, information governance, and compliance. We’ll show you how you can leverage SharePoint, Collabware, and Collabspace (Collabware’s innovative cloud offering) to make the most out of your digital investment. Come by Gravity Union’s booth where you can chat with our CEO and lead consultant Michael Schweitzer, and SharePoint ECM consultant Kris Anderson. See you there! Gravity Union will have a booth at the event, so swing by and come chat to us about all things SQL Server and Power BI. Our consultants Jeff Dunbar and Michael Marchetto will be there to share their expertise. See you there! Counting Down to SharePoint Toronto 2018! At Gravity Union, we’re counting down to next month’s SharePoint Toronto event on November 24th, 2018! If you’re a SharePoint user in Greater Toronto Area, be sure to attend the event, check out our presentation, and network with fellow Torontonian SharePoint users. Can’t wait to see you there! Check Out Our Presentation at SharePoint Calgary 2018! We're super excited to be presenting at the Calgary SharePoint Saturday event next month on November 17th, 2018! Our founder and principal consultant Michael Schweitzer will be delivering a talk on saving money and improving compliance by standardizing on SharePoint for ECM. See you at SharePoint Saturday Ottawa 2018! SharePoint administrators, end users, architects, developers, and other professionals that work with Microsoft SharePoint Technologies will meet once again for their 7th annual SPS Ottawa event 2018 on November 10th at Algonquin College located at 1385 Woodroffe Avenue, Ottawa, Ontario, Canada, K2G 1V8 (Building ACCE). SharePoint Saturday Ottawa is an educational, informative, and interactive day filled with sessions from respected Asure, SharePoint and Office 365 professionals covering a wide variety of SharePoint/Office 365-orientated topics. SharePoint Saturday is FREE, open to the public and is your local chance to immerse yourself in SharePoint & Office 365! Be sure to tune in to our presentation if you’re planning to go to SharePoint Saturday Ottawa! We look forward to seeing you there! The benefits and risks of an organization’s critical information assets are widely acknowledged, but how to harness that benefit and appropriately mitigate that risk continue to be real challenges for most organizations. There is an urgent need to ensure programs and solutions are designed to address the full life cycle of information in a comprehensive way. From October 22nd-24th, you can join Gravity Union at ARMA Live 2018 Conference where you will get the chance to connect with industry professionals, learn about information and records management, and shape the industry. The networking opportunities and education sessions at the Conference will educate, empower, and embolden you so that you can make a greater, more positive difference in your organization and community. Learn more about ARMA Live 2018 Conference here. We hope to see you there! 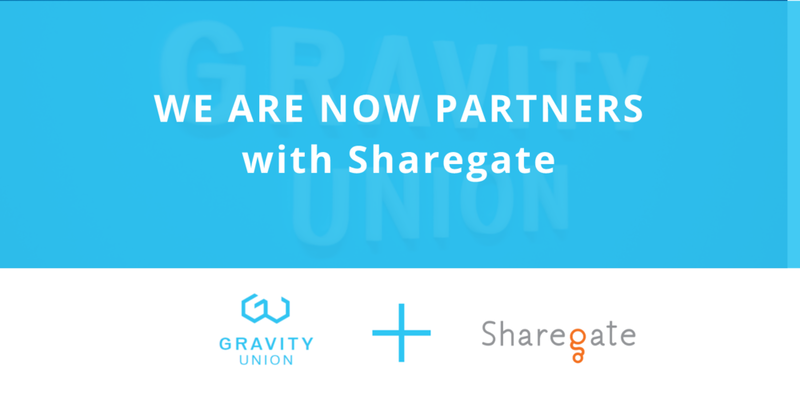 Gravity Union, a leading implementation partner of SharePoint and Collabware, today announced that it has signed a partnership agreement with PSIGEN. As a PSIGEN partner, Gravity Union has the ability to resell and implement one of the world’s leading data capture and extraction solutions. PSIGEN’s stable document processing solutions extends the breadth of the Gravity Union’s offering when it comes to enterprise content management. “For years we have enjoyed enormous success implementing SharePoint and Collabware solutions for our customers and with the recent addition of PSIGEN to our service offering, we have the opportunity to expand on this success. Gravity Union can now offer customers the opportunity to automate the capture of specific information from their physical and electronic documents. For example, no more manual rekeying of information from invoices, contracts or agreements." says Rod Hicks, Director of Business Development. With PSIGEN's PSIcapture solution, users can take a scanned document, identify the document and extract the necessary information and migrate that information to a specific location, such as SharePoint. Once in SharePoint, Collabware CLM can apply retention rules - which means one automated process from scan to data to storage to record creation. For more than two decades, PSIGEN has provided software to improve processes around the capture and management of paper, digital documents and other mission-critical information. “We are excited about our partnership with PSIGEN,” says Michael Schweitzer, Gravity Union’s Founder and CEO. "Our customers will greatly benefit from the process improvement provided by PSIGEN's applications." "Gravity Union's expertise, combined with the document capture capabilities of PSIGEN, can benefit our customers by automating their complex business processes and providing them with greater control over their documents, " says Schweitzer. PSIGEN Software, Inc., is an innovative developer of end-to-end document capture, business process automation and content management solutions. Congratulations to our friends at Collabware – their Collabware CLM is now DISA JITC certified for DoD 5015.2 compliance! DoD 5015.2 is the U.S. Department of Defense’s (DoD) Design Criteria Standard for Electronic Records Management Software Applications. It is endorsed by government agencies worldwide, including the National Archives and Records Administration (NARA), and its standards have been used as a basis for many global records management benchmarks. Following its adoption by the public sector, many private sector businesses now routinely use the certification as the “Gold Standard” for records management solutions. Aligning with Presidential Mandate M-12-18 for federal government bodies to go paperless and enlist proper electronic record keeping systems by the December 31st, 2019, Collabware provides assurance to records managers that legal and regulatory compliance guidelines are being met. Collabware CLM enhances Microsoft SharePoint with functionality to ensure complete and compliant records management along with fully automated workflows for content lifecycle management. Congratulations again to Collabware for achieving this important certification! To read the story on Collabware's website, click here. Collabware provides intelligent information management and team collaboration software designed to make teams more productive, protect high-value information, and help organizations rapidly locate the information they need to make better decisions. With offices in Canada, USA and the UK, Collabware has been internationally deployed by companies in regulated industries, including finance & insurance; mining & natural resources; government; healthcare & pharmaceutical; manufacturing, utilities & transportation; and entertainment & education. For more information, visit www.collabware.com. We are excited to announce that we will be at Office 365 Saturday Vancouver 2018! It's an eventful time for Gravity Union with employees busy preparing to attend the ARMA Canada Conference taking place from May 28-30 in Vancouver, Canada. Each year, ARMA Canada's annual conference brings people together from all across Canada (government, private sector, and not-for-profit) and provides educational sessions, networking opportunities and knowledge of current services and technologies through the Exhibit Hall. Come visit us at booth 5! Our founder and principal consultant, Michael Schweitzer, is a regular at ARMA Canada and this year, our consultants will be there in person to actively promote Collabware and its key features at the booth. In addition to the booth, Gravity Union welcomes everyone to attend their presentations at ARMA Canada Conference. The records management community is currently challenged with an ever-changing and increasingly fractured digital landscape. In this session, we’ll walk you through how emerging technologies like Blockchain, Applied Artificial Intelligence such as Machine Learning and Deep Learning, Quantum Computing and Cloud Computing will help create the records management systems of the future. Michael Schweitzer is the CEO, founder and principal consultant of Gravity Union Solutions Limited, a consultancy firm that specializes in creating user-focused and highly adopted ECM solutions built on the Microsoft stack including SharePoint, Collabware, Nintex and Office 365. A guided tour of the First Nations Summit’s SharePoint and Collabware implementation, with a brief history of the project and lessons learned along the way. This case study will outline the project requirements, the process for software selection, how we approached the implementation, and the sometimes-arduous journey from (pipe) dream, to glaring reality. Sandra will provide the context for the project and Sam will take you through the inner sanctum to see how it all works to meet the recordkeeping needs of the First Nations Summit. Sandra Dunkin (MLIS, CRM, IGP) is the Records & Information Management Coordinator at the First Nations Summit (FNS) where she also has responsibility for IT. Sandra is the project manager for the SharePoint implementation at the FNS. She is also currently Chair of ARMA Vancouver’s First Nations RIM Symposium Planning Committee. Sam Hoff is an ECM Consultant at the Gravity Union. He is passionate about providing user experience focused solutions to meet records management needs. Having backgrounds in both the technical and human sides of technology, he has been focused on ECM and Records Management solutions based on SharePoint for the past five years. Gravity Union named finalist in the Best Service Provider category at the 2017 Information Governance Conference! We're Sponsoring SharePoint Saturday Ottawa! Join Gravity Union along with Azure, Office 365 & SharePoint administrators, end users, architects, developers, and other professionals that work with Microsoft Technologies for the 6th annual SPSOttawa event on October 28th at Algonquin College ocated at 138 Woodroffe Avenue, Ottawa, Ontario, Canada, K2G 1V8 (Building T & Salon). Gravity Union is excited to be presenting at the 2017 ARMA Canada Conference in Toronto, Ontario! Collabware makes CIO Review Magazine's top 20 most promising SharePoint solution providers! Collabware makes the cover story of CIO Review Magazine! We're sponsoring SPS Vancouver 2017! Looking forward to seeing everyone at the 2nd annual SharePoint Saturday Vancouver event on April 8th, 2017 at UBC Robson Square located at 800 Robson Street, Vancouver BC, Canada! Check out our recent webinar that we recorded with Collabware on Up and Running with SharePoint Records Management in 90 Days or Less!